I was born in Galway in 1975. I've published some thirty articles since 1998 on various subjects, mainly concerning families of Galway town and county. 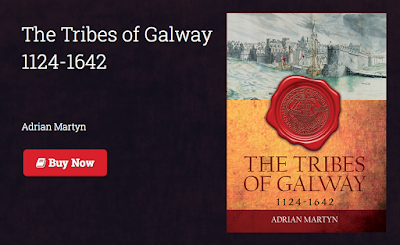 My book "The Tribes of Galway" is due out in 2014. I'm a Medievalist (i.e., anything up to 17th century), with particular interest in the origin of Gaelic Irish surnames in the era c.950-1200, and their subsequent medieval history. Both sides of my family were good oral historians, so since childhood I knew my genealogy back as much as six generations on at least six ancestral lines (Martyn, MacLoughlin, Doherty, Gegan, Gibbons, Lally). I lacked a decent career guidence counsellor at Secondary School and while repeating the Leaving Certificate, spent some time in the Irish music business instead of getting involved in historical research. I began researching the Martyn 'tribe' of Galway in 1996 purely out of curiousity, encouraged by the late Shevawn Lynam, then left the music business at the end of the same year, and have been involved in historical research ever since. My pet project is the origins and history of the fourteen merchant families of medieval/early modern Galway, known since the 17th century as the Tribes of Galway. I became very intersted in the ramifications of genetic genealogy in very early 2000s, because most of us in Ireland cannot trace ourselves generation-by-generation beyond circa 1800. In spring 2003 I established the Martyn DNA project on FamilyTreeDNA but because of serious illness was obliged to leave it and much else aside for several years. My presentation will focus on the Medieval Families of Galway Town (and why we need DNA studies on them), with especial reference to the Tribes of Galway (see names below). The fourteen Tribes of Galway, namely Athy, Blake, Bodkin, Browne, Darcy, Deane, Font, French, Joyce, Kirwan, Lynch, Martyn, Morris, Skerrett. 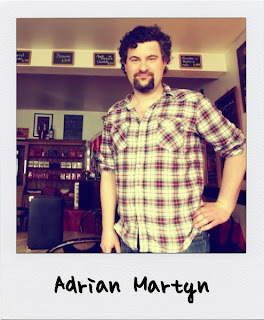 Adrian has just published the long-awaited book on his research and it is available now at his website www.adrianmartyn.ie.